The Allotmum: What's attacking my leeks? 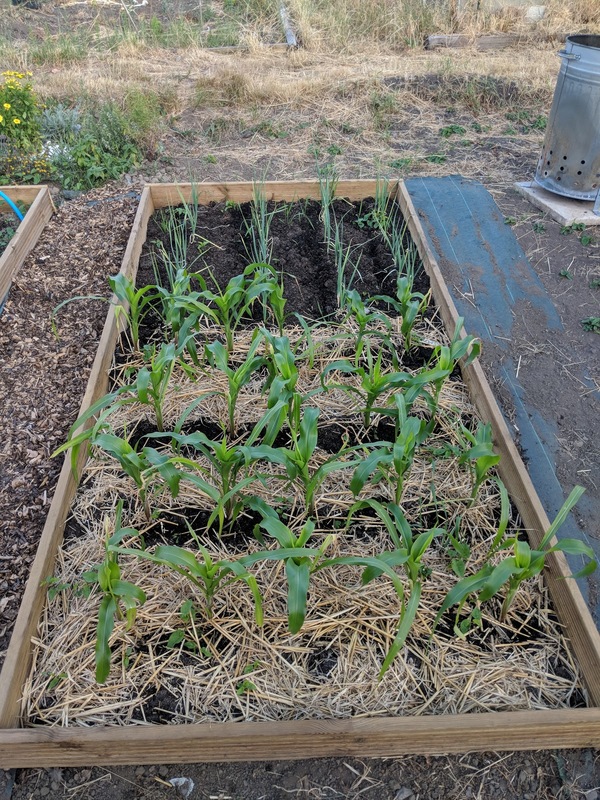 A chronicle of a first-time allotment owner digging her way through the highs and lows of grow-you-own with two kids in tow. A few weeks ago I shared a picture of how well my Musselburgh leeks were doing. 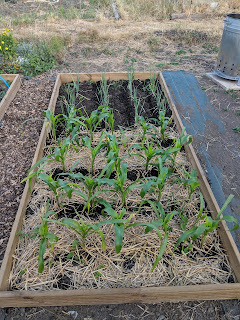 They were planted in rows in a raised bed, alongside some minipop sweetcorn plants. I had bought them as young plants, put them in at the end of July and they seemed to be doing really well. At least I thought they were doing well anyways. Today I got a chance to take a look at them and to my horror, there were tiny caterpillars happily munching away at my baby leeks. I whipped my phone out and started furiously googling what could have caused it. Because this is my first time growing leeks, I had no idea about the types of bugs that could infest them so good old Google came to the rescue. I knew all about leek rust but this didn't look like it, and I realised I knew nothing about something called Leek moths. My search brought me to something called the leek moth. Read the whole RHS factsheet here. I can be forgiven for missing the leek moth as the adults only grow to around 6mm long, so teeny tiny. They lay eggs on the young leek plants at the beginning of summer and these become caterpillars. But there's a double whammy, these moths produce two generations over a summer so there's another fresh batch of eggs come late summer after the first generation of caterpillars have pupated and laid another load of eggs. So if you don't catch them first time around, you'll definitely see them second time as these ones do some serious damage to the now maturing plants. The brownish-white caterpillars are small, around 11mm long and feed on the outer leaves of the leeks. Once they've had their fill they move towards the inside of the leek and basically eat it from the inside. 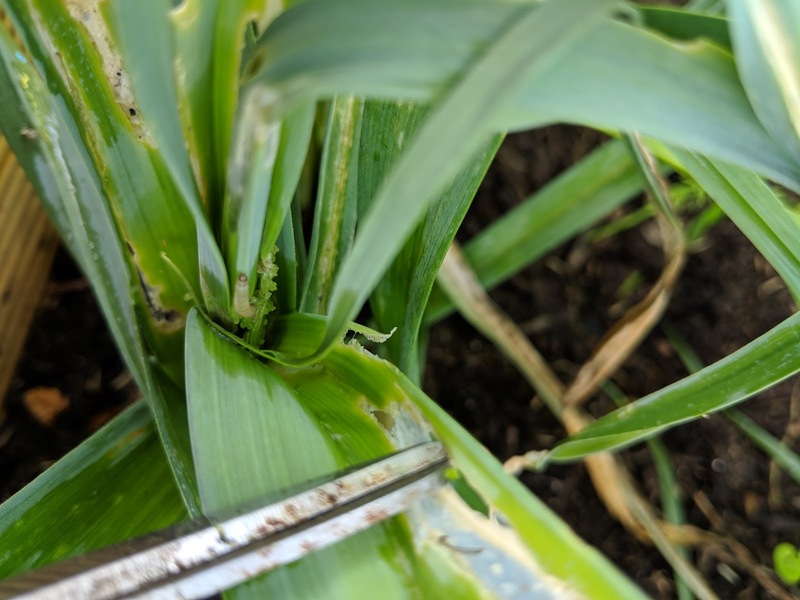 Pretty devastating for a crop as even though the caterpillars don't eat the entire plant, the damage they do causes secondary rotting and the leeks will wither away due to the extensive damage. You can gain the upper hand by searching out the caterpillars and destroying them. On a commercial scale this is totally unfeasible but with my 30 odd plants I was willing to give it a go. I put on my rubber gardening gloves and began carefully opening up the leeks leaf by leaf to find the little blighters. They tend to hide really deep in the crevices of the leeks so I did an experiment to see if I could get them out without causing too much damage to the plant. I mixed some fairy dish liquid and water in a spray bottle and sprayed each leek from directly above, so that the outer and inner leaves fill with soapy water. To my surprise, after a few minutes, the caterpillars all started to make their way up the stems and on to the outer leaves, trying to escape from a soapy doom. I was there, ready for them, with my scissors! I simply snipped them in half as I found them. I know it seems cruel but there is no way I'm letting them ruin a crop I was really excited to be growing! I'll go back either tomorrow or on the weekend for another look and hope that I've got rid of the majority of them. Have you had problems with your leeks this year? How do you protect your crop from such invaders?